The World Turning Upside Down! The Spirit of Antichrist in End-Times! The Acceleration of Prophetic Signs! The Alignment of Dark Forces! Globalism brings Rise to End-Time Antichrist! The Wise and The Foolish! God brings Order out of CHAOS! Foreshadow of Things to Come! Prepare The Way for the 3rd Temple! Understanding ISLAM - the Enemy of the West! Fire in Israel - God's Warning? God's Prophetic Timeline for Israel! Going Out and Coming In! Arab Lies, Myths and More Lies! The Sun Rising in the East or West? The Final Battle for Jerusalem has begun! How the WEST was LOST! Turkey the Open Door for Radical ISLAM! In the Twinkling of an Eye! GAZA in Prophetic End Times! Israel where History & Prophecy Collide! The Times of The Signs! Peace when there is NO peace! ISRAEL a Mystery of TIME! Is ISLAM the Green Horse of Revelation? Are the Black Clouds Rising Again? What makes the nations hate Israel? Woe will be the divide of Jerusalem! If the Mountains could speak? Who will be the donkey? What's the 'Big Deal' about Israel? Bible Prophecy - KEY to Kowing the Future! 5779 Tet - The Year of God's Goodness! A Time for Everything UNDER the SUN! The Power of the Blood! Why Christians should STAND with ISRAEL! Pillars of Clouds and Pillars of Fire! The 10 Unchangeable Laws of God! A Servant of the LORD! God's Language of Hebrew Numbers! The The Power of Worship! Angels the Secret Agents of God! Flowers Foreshadow the Messiah's Return! 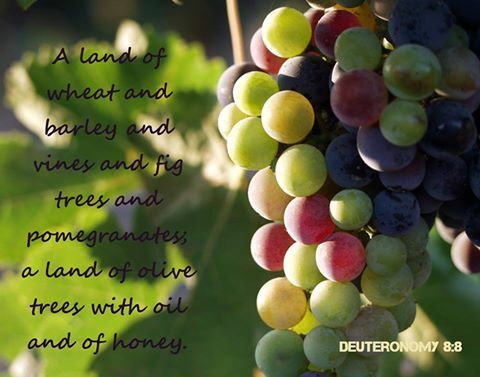 There are “Seven Species” (shivat haminim) of food in the Bible that God assured His people that they would find in the Promised Land (Deuteronomy 8:8) and are listed in the order that they are ready to harvest; barley, wheat, grapes, honey, figs, pomegranates and olives. In Israel’s agriculture cycles the “fall” (autumn) rains are desperately needed right after the “Feast of Tabernacles.” These are early rains that soften the ground for the planting and germination of the winter seeds. The former rains prepare the earth for the first-fruits. Then in the early spring the latter rains are needed for the new crops – the “barley,” and two months later the “wheat” crop. These spring rains also prepare the “grape vines” and late-ripening summer fruit, including the “fig” trees, the “pomegranates” and the “olive” trees. The latter rains prepare the earth for the final harvest. The “honey” listed in Deuteronomy 8:8 is the “date syrup” that comes from palm trees …making palms one of the seven species of promise. In ancient times the Judean date palms was a staple source of food, shelter, and shade but sadly were wiped out by about 500 AD. Dates were famous in antiquity for medicinal value and were widely used for different diseases such as cancers, TB (tuberculosis) and other kinds of health problems. When the Romans invaded Ancient Judea, thick forests of date palms up to 24 Metres (80 feet) high and 11 kilometres (7 miles) wide covered the Jordan River Valley from the Sea of Galilee in the north to the shores of the Dead Sea in the south. There are countless palm trees in Israel and a wonderful Biblical significance to the tree which we can see and remember every time we eat its fruit. Today's date trees in Israel are from those imported during the 1950s and '60s from modern cultivated Iraqi, Moroccan, and Egyptian varieties because of the total neglect of the land of Israel under foreign Gentile Rule. In the 1960’s archaeologists discovered an ancient jar containing palm tree seeds of Biblical time that were 2,000 years old in Herod’s Great Palace at Mount Masada which was the last stand of a small band of Jewish rebels who held out against three Roman legions for several years before committing mass suicide in 73 AD to avoid Roman slavery and cruelty. The seeds were later found in the sealed jar in a drawer at Tel-Aviv’s Bar-Ilan University in 2005 where they had been placed and forgotten for 40 years …Israeli researchers in Jerusalem cultivated them and one of the seeds was nicknamed “Methuselah,” after the oldest person in the Bible. The resurrected Methuselah, Judean date palm tree is also referred to as the Yeshua, “Jesus” as it was resurrected! 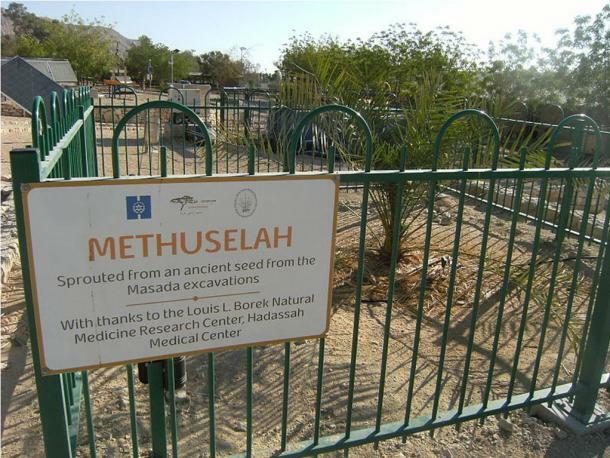 Methuselah is remarkable in being the oldest known tree seed successfully germinated, and also in being the only living representative of the Judean date palm, a tree extinct for over 1,800 years, which was once a major food and export crop in Ancient Judea. To their surprise this historic plant did germinate and by November had grown into an 80 centimetre (3 feet) high tree with 9 leaves and looked just great! What is interesting too is that date palms are either male or female and cannot produce fruit without the other… They are also thought to be reminiscent of the Garden of Eden when God made male and female; “And God blessed them, saying, Be fruitful and multiply, and fill the waters of the seas and let the fowl multiply in the earth,” Genesis 1:22. The Temple was decorated with multiple pairs of trees, male and female either side of the doorways as if welcoming those who enter and suppose to represent “a way back to paradise and right relationship with God.” Palm trees are mentioned 32 times in the Bible. Palms decorated Solomon’s Temple, and is on the doorways in Ezekiel’s description of the “Third Temple.” The city of Jericho is often referred to as the “City of Palms” and the woman in the Song of Songs is twice likened to a palm tree. The leaves were used in “Sukkot” - the “Feast of Tabernacles” (and still used). 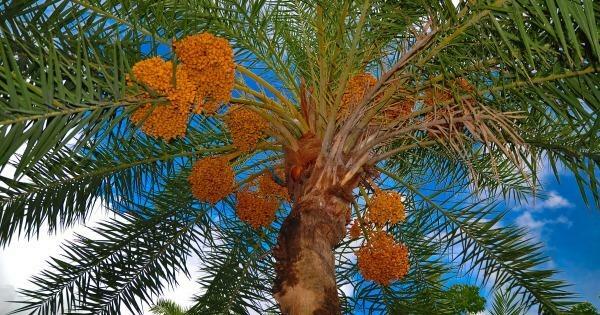 The palm is also one of four types of plant that God ordains for the celebration; myrtle, palm, willow branches and the citrus fruit. It represents “strength” and “backbone” and the sweet fruit of the palm represents those who love God’s law. The leaves were waved in victory and praise as Yeshua (Jesus) entered Jerusalem and is also in the book of Revelation. If palm trees were used to welcome the Lord’s First Coming to Jerusalem at the Feast of Tabernacles …and wont it therefore also be a sign of welcome and victory at His Second Coming when our King returns again to “Tabernacle” among us? The Pomegranate… is an ancient fruit of the Bible (Numbers 13:23, 20:5; Deuteronomy 8:8) not only for its beauty but also for its anti-oxidant qualities and health benefits. The word pomegranate is “rimon” in Hebrew which means “to rise up” …and the Latin words “pomum” (apple) and “granatus” (seeded). It belongs to the “myrtle” family of trees. It was one of the seven species brought back by the spies to show how fruitful the Promised Land was! Interestingly, many Jewish scholars believe that the pomegranate was the “forbidden fruit” of the Garden of Eden. In Exodus 28:33-34 images of pomegranates were woven into the hem of the “robe of ephod” interspersed with “bells” which was worn by the Hebrew priest. With every step that the high priest made, the ringing of these bells with the symbol of for “fertility of life,” bore witness to sight and sound and declare a righteous life. Pomegranates are also listed in the Bible in 1 Kings 7:13-22, where the fruit is depicted on the capitals of two pillars which stood in front of the temple that King Solomon built in Jerusalem. King Solomon is said to have designed his crown based on the “crown” of the pomegranate. The withering of the pomegranate tree is mentioned among the judgements of God (Joel 1:11-12). The significance of this Jewish pomegranate is further exemplified by its appearance on ancient shekel coins of Judea and is one of only a few images that appear as a holy symbol. 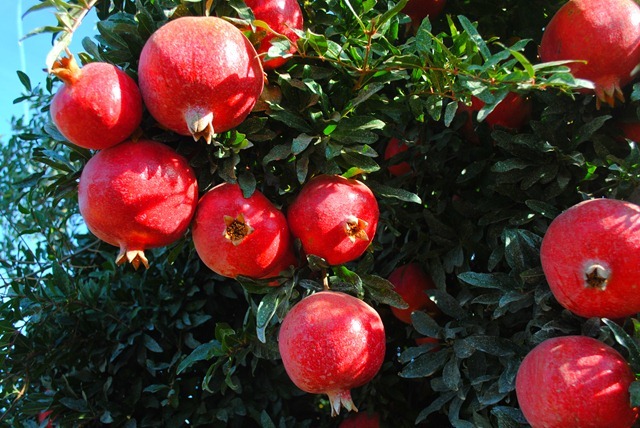 Jewish tradition teaches that the pomegranate is a symbol of “righteousness” …because it is said to have 613 seeds which corresponds to the 613 Mitzvoth or Commandments of the Torah (first 5 books of the Bible) and for this it is customary to eat pomegranates on Rosh Hashanah (Day of Atonement). It also represents; fruitfulness, knowledge, learning and wisdom. 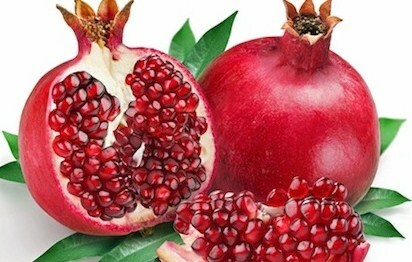 It is mentioned in the Song of Solomon 4:3, 13, and King Solomon uses the pomegranate theme for his bride’s temples …and to show fertility of the mind where good seed is planted and a harvest is sure to come. Her thoughts are on what is “pure, lovely and of good report. She is the “true bride” with a mental state that matches “the King’s.” Here we find reference to the Holy Spirit for “things to come” and the words Yeshua (Jesus) are quickly brought to mind and the church which is the “Bride of Christ!” No matter how you slice the Pomegranate it is a beautiful reference to the “Body of Christ” and each little fruity seed is made perfect together …yet set apart from the whole pomegranate, are incomplete! “Let us rise up early to the vineyards; let us see if the vine flowers, whether the tender grape appears, and the pomegranates bud forth; there I will give you my loves.” Song of Songs 7:12. 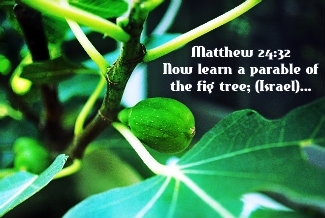 The fig tree as a symbol or figure of Israel was used by Yeshua (Jesus) in the New Testament. This symbol is also used in the Old Testament, where the Lord said of Israel, “I saw your fathers as the first-fruits on the fig tree in its first season,” Hoseah 9:10. And, in Jeremiah 24:5 He said, “Like these good figs, so will I acknowledge those who are carried away captive from Judah, whom I have sent out of this place for their own good, into the land of the Chaldeans.” Jeremiah uses the loss of the fig harvest as a way to emphasize what enemies would do and in another passage, he uses a lack of a fig harvest as a way to describe spiritual poverty. Jeremiah 24:1-3, we see good figs as a way to describe God’s salvation… and also bad figs as describing punishment. One of the parables in Luke 13 tells about how God gives people a chance to follow Him, but, if they don’t they will be destroyed like an unfaithful fig tree would be! 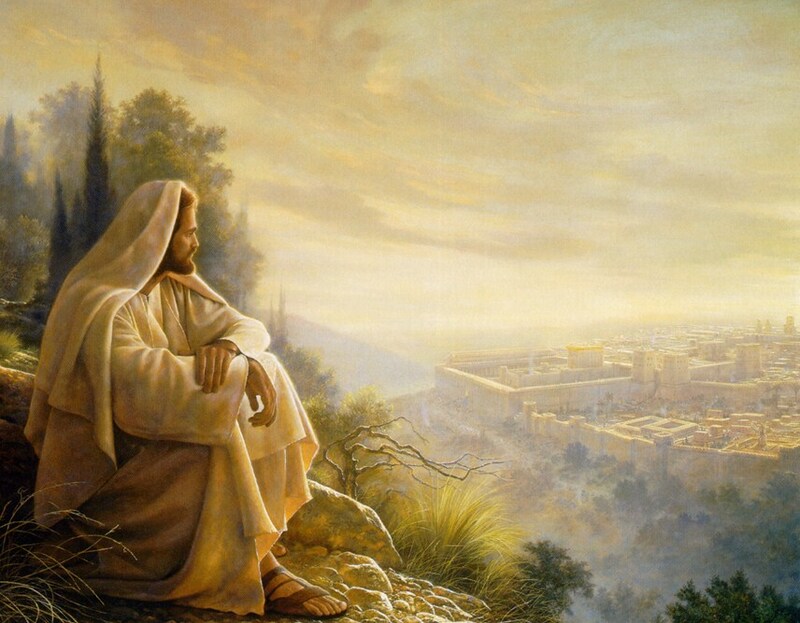 The parables of “the fig tree” (Israel)… are the budding of the fig tree, which indicates the reviving of Israel back in their land …as well as the restoration of Jerusalem (1948) as their capital city (1967). They are both well defined end-time signs. When we see these things we should know that the coming of Christ is near! The “fig tree” is Israel and all the “other trees” are the nations! A great joy should fill our hearts when we see the promise of God fulfilled in the restoration of Israel. We should always see the hand of the Lord in these events. The Lord says, “Surely I will take the children of Israel from among the nations, wherever they have gone, and will gather them from every side and bring them into their own land,” Ezekiel 37:21. Jerusalem is an important symbol of God’s intervention in human affairs and the fact that the “trampling of Jerusalem” by the Gentiles (non-Jews) has ended, the city already being in an advanced stage of restoration, is strong evidence that we are in the last generation before the Second Coming of Christ! "When you see Jerusalem surrounded by armies, then know that its desolation is near …For these are days of vengeance, that all things which are written may be fulfilled …And they will fall by the edge of the sword, and be led away captive into all nations. 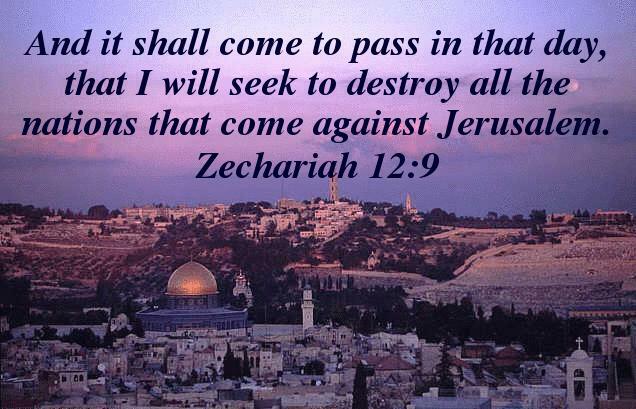 And Jerusalem will be trampled by Gentiles until the times of the Gentiles are fulfilled. And there will be signs in the sun, in the moon, and in the stars; and on the earth distress of nations, with perplexity, the sea and the waves roaring; men’s hearts failing them from fear and the expectation of those things which are coming on the earth, for the powers of heaven will be shaken. Then they will see the Son of Man coming in a cloud with power and great glory. Now when these things begin to happen, look up and lift up your heads, because your redemption draws near. And He spoke to them a parable; Look at the fig tree, and all the trees. When they are already budding, you see and know for yourselves that summer is now near. So you, likewise, when you see these things happening, know that the kingdom of God is near. Assuredly, I say to you, this generation will by no means pass away till all things are fulfilled" (Luke 21:20-32). Grapes are harvested in Israel generally mid to late summer. In Joel 1:7, Israel is represented by both a “vine” which can be no other than the “grape” and as a “fig tree.” In Psalm 80:8-16, we see God reminding Israel that He brought “the vine” out of Egypt and it was not by their effort. In the Lord’s “planting,” Israel the “choicest vine,” in His very fruitful hills and He spared no effort in preparing the soil in which they were planted! 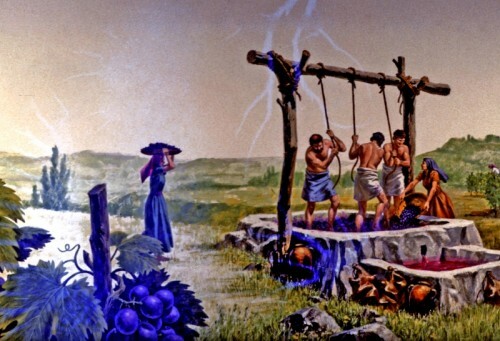 (Isaiah 5:1-7) Although the history of Israel while she was marked with great difficulties and much trouble …she like a “vine” – spread out and filled the entire land. 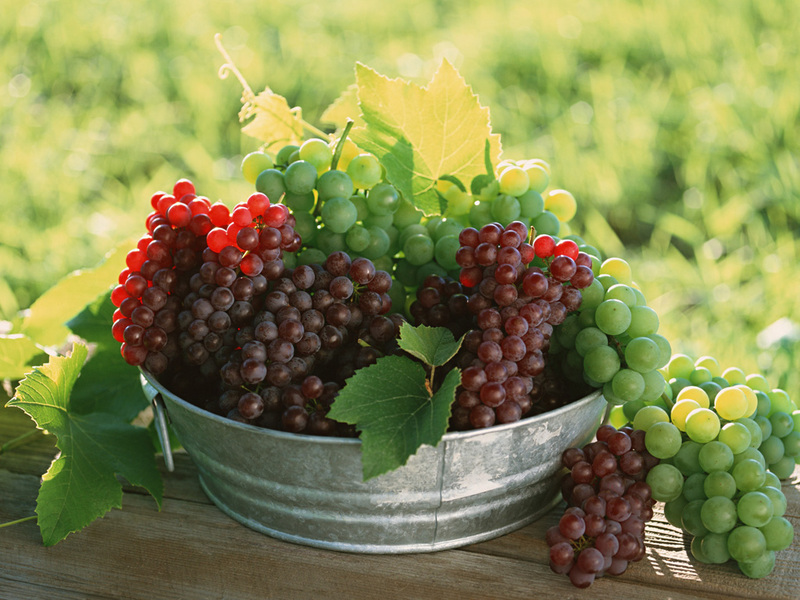 Mentioned more than any other plant in the Bible, the “grape vine” was very important culturally and economically in Biblical times. The prophets likened Israel to the “vine” or a “vineyard” and a 1st Century Jew would be very familiar with the symbolic meaning of “vine” or “vineyard” and in fact Yeshua (Jesus) also used it as a motif symbolism for Israel in Mark 12:1-2. However the references to the “vine” or “vineyard” in the time of the Old Testament …as well as the parables of Yeshua (Jesus) brought to mind imminent judgment that God would bring upon disobedient people. 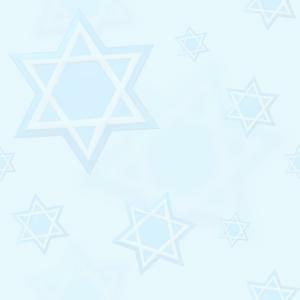 So how could something that symbolized the whole people of Israel be a symbol of the Lord…? Therefore the Gospel of John refers to Yeshua (Jesus) as the “TRUE Vine!” The contrast is made between Israel and Yeshua – not the Church. The Church is not the true vine …Yeshua is! Furthermore He is not the trunk or the root …Yeshua is the true vine! The Church can be a part of the destiny …BUT only as the branches in the vine. The Church cannot fulfil Israel’s destiny and apart from Christ …the Church is nothing but dead twigs! Everything is intertwined! We are reminded of the Lord’s teaching of the “fruit of the vine” and His instructions as we take communion. Yeshua (Jesus) blood was poured out for all of mankind and as His followers we are to be poured out in faithful service to Him (Matthew 26:29; Mark 14:24; Luke 22:17-18). 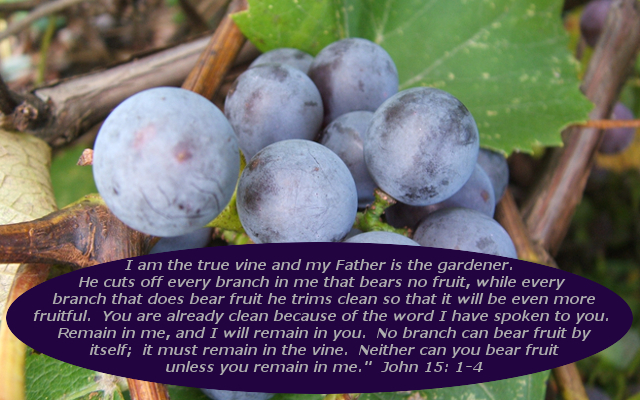 The key here is to remember Yeshua’ (Jesus) Words… “I am the Vine, and you are the branches. He who abides in Me, and I in him, the same brings forth much fruit; for without Me you can do nothing!” John 15:5. John connects the time of the “first harvest” – the “first-fruits” of the Passover Crucifixion to the resurrection of men (1 Corinthians 15:20). During the Lord’s First Coming, He particularly mentioned two fruit; the fig - when He cursed the fig tree for having no fruit (Mark 11:12-25) and warned the vinedressers of the grapevine of the danger of not properly attending to their responsibilities of being God’s guardians of His vineyard and by rejecting Him (Matthew 21:33-46). Yeshua (Jesus) reminded His disciples that they should be “good vinedressers” and faithful servants if they were to experience the fullness of God’s blessings (Matthew 20:1-16). Perhaps one of the most graphic images of God’s coming day of worldwide wrath upon a disobedient, unfaithful mankind is the reaping of the ripe harvest of the earth… in Revelation 14, we are told that the time for the Son of Man to “reap” the earth had come …for the “harvest was ripe!” There we are also told that one of God’s angels who held a “sharp sickle” was instructed “to use your sharp sickle and gather the clusters of grapes off the vine of the earth!” The angel swung his sickle over the earth and gathered from the vineyard of the earth and tossed them into the great winepress of the wrath of God …then the winepress was stomped outside the city (Jerusalem) and blood poured out of the winepress up to the height of horses’ bridles for a distance of a thousand six-hundred furlough (about 322 kilometres or 200 miles). The Fruit of the Spirit… Paul refers to “fruit” singular rather than “fruits” which are plural. A believer filled with God’s Holy Spirit will not only do the things of Christ … but will be at the very heart of a person who models the God he serves! “But the fruit of the Spirit is: love, joy, peace, long-suffering, kindness, goodness, faithfulness, meekness, self-control; against such things there is no law,” Galatians 5:22-23. The Hebrew words: Love is “ahavah” (Greek word is “agape”) …and is the first fruit and rightly so as God is love. Joy is “simchah” (Greek word is chara related to “grace”) …and is a characteristic mark of the Grace of God and of hope. Peace is “shalom” means more than absence of “strife” but “wholeness, health, balance, completeness.” Long-suffering is “erekh apayim” (Greek word makrithumia from the word macros) is attribute of mercy. Kindness is “nedivut” (Greek; Krestotes) refers to kindness to others or generosity. Goodness is “gemilut chasadim” …and is referring to acts of kindness that are esteemed in the eyes of God or “ayin tovah” meaning a “good eye” with a generous spirit. Faithfulness is “ne’emunut” (Greek – “pistis”) – attitude of believe or trustworthiness, reliability and dependable. Meekness is “anavah” meaning “humility” and lowly in heart, esteeming others worthy of honour. Self-control is “tzeniut” meaning “modesty” especially in reference to sexual affections or desires. We cannot be transformed into God’s likeness by our own efforts and just as Yeshua (Jesus) said, “apart from Me you can do nothing!” John 15:5 …This miraculous transformation only occurs by the power of God and by His Holy Spirit dwelling in us. Fruit is also important as the means by which we can tell the true from the false (Matthew 7:15-20). To be an effective witness for our Lord and Saviour …we must walk in love …we must be the branch so glorious looking …we must be so overflowing with fruit that the people of this world will desire to come to us to eat and be nourished. This is why it is important for us to stay on the vine, Yeshua (Jesus), as we are His branches …apart from the vine we will wither and die. Acts 17:28 says, “For in Him we live and move, and have our being!” We want our fruit as believers especially in these last days to be appealing to others, desirable just like the honey from the dates and as refreshing as the grape juice from the vine …and the righteousness of the fruitful pomegranate!. It may be that now is the time to get “pruned” a bit and begin working on developing the “Fruit of the Spirit” in our lives. Pruning may not feel so good at first but how wonderful the growth looks. We can walk in the Spirit and be beautiful branches on the Lord’s vine! This can be done SECURELY through PAYPAL on our Donations page where you will find the list of ministries where you can be a blessing to. Thank you for your love and support for God's chosen people (Ruth 2:12). John Bunyan once said, "You have never lived successfully until you have done something for someone who can NEVER repay you!" Copyright © 2019, PRAY 4 ZION (NPO 056-341). All rights reserved.